Space Safety » Archive » Engineering » Spacecraft Design » The X-37B Space Plane: Where is it now? The OTV-1 in front of half of the Atlas V fairing awaiting encapsulation in 2010 (Credits: US Air Force). The X-37B space plane has intrigued the space community for years. Originally developed by NASA, the project migrated to DARPA and then to the US Air Force, where it now resides. The concept behind the X-37B is similar to that of the Space Shuttle whose body it resembles: a reusable orbital vehicle that can be used to conduct flexible and retrievable experiments in space. Experimental return is one of the key gaps in current service from the International Space Station. After years of development, evolution, and failures, the X-37B’s current incarnation has been described as spectacularly successful. Designed for a maximum 270 day orbit prior to autonomous reentry and landing, the second X-37B test vehicle, Orbital Test Vehicle 2 (OTV-2), is well past the 400 day mark and still orbiting. The OTV-1, which completed a 225 day test run in 2010, is slated to launch aboard an Atlas V in the fall of 2012 for its second mission. Its first mission saw the first instance of fully autonomous landing of a United States spacecraft. It was preceded only by the Russian Buran shuttle in 1988 in this capability. When the OTV-2 will return to Earth is an open question, as the Air Force is keeping a tight lid on all information relating to the vessel’s mission. The X-37 project began under NASA’s purview in 1999. At that time, the vehicle was intended to deploy from the Space Shuttle bay, but that approach was deemed uneconomical, so it was redesigned for launch from the Delta IV rocket. The X-37A underwent drop tests from Scaled Composites’ White Knight aircraft, suffering several failures to detach and one runway overrun on landing that resulted in minor damage to the craft. NASA walked away from the X-37 project, focusing resources on its commercial crew and cargo initiatives, but DARPA picked it up in 2004 at which point much of the development became classified. In 2006, the Air Force began the X-37B project, also classified, heavily based on the preceding X-37A. Boeing continued to be the prime contractor for the X-37 series. In October 2011, Boeing Space and Intelligence Systems Experimental Systems Group chief engineer Arthur Grantz announced a new iteration of the space plane to be in the works. The X-37C would be a larger version of the X-37B and could carry six crew members and potentially support the International Space Station. The announcement, made at a American Institute of Aeronautics and Astronautics (AIAA) conference, electrified the space community, resulting in an enduring buzz despite Boeing declining to provide any further details of the project in the time since. The X-37C could potentially overlap with Boeing’s CST-100 commercial crew capsule, also intended to deliver crew and cargo to the International Space Station. That project is supported under NASA’s Commercial Crew initiative. 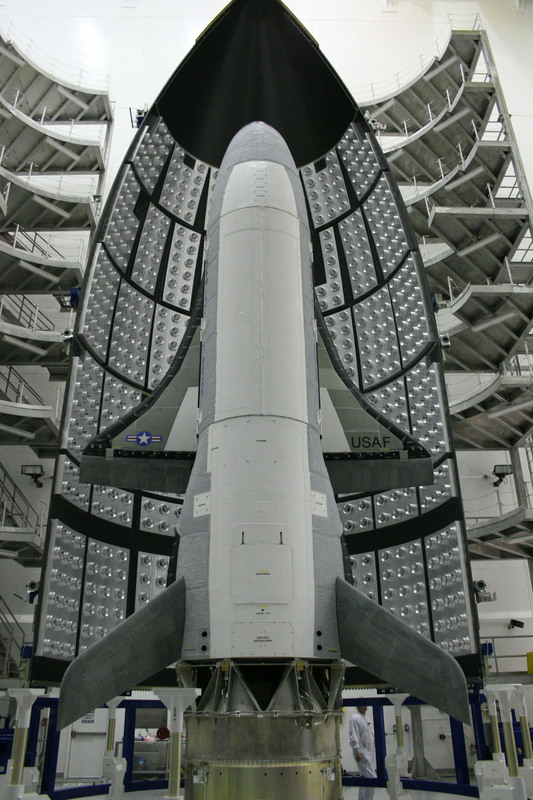 NASA’s Ames Research Center recently won an innovation award for development of the X-37’s thermal protection system. The Toughened Uni-piece Fibrous Reinforced Oxidation-Resistant Composite (TUFROC) tiles are one of the significant improvements the X-37B enjoys over the Space Shuttle. The original X-37 concept included the capability to rendezvous with and refuel or repair on-orbit satellites. Whether such capability will be pursued within the Air Force’s objectives of “space experimentation, risk reduction, and concept of operations development” remains to be seen.